MFQ - Classic Dome Milgrain Brushed Wedding Ring Modest and minimalistic in design, the Milgrain Brushed Wedding Ring is the perfect choice for sophisticated brides and grooms. In addition to white gold, it is offered as a ceramic ring, tungsten ring or cobalt ring, and it is available in 6.5mm and 8.5mm widths to complement both larger and smaller hands. Customise with a white, yellow or rose insert in 10kt, 14kt, or 18kt gold, and personalise with our engraving service. Modest and minimalistic in design, the Milgrain Brushed Wedding Ring is the perfect choice for sophisticated brides and grooms. 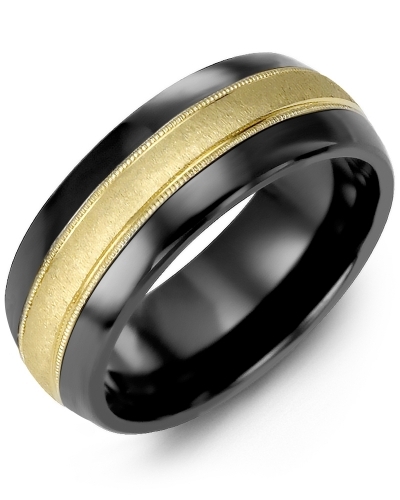 In addition to white gold, it is offered as a ceramic ring, tungsten ring or cobalt ring, and it is available in 6.5mm and 8.5mm widths to complement both larger and smaller hands. Customise with a white, yellow or rose insert in 10kt, 14kt, or 18kt gold, and personalise with our engraving service.